If you are a data scientist, the answer is no! You can have both; as long as your data-driven stories are built on solid research ground. A data scientist utilizes techniques and tools found in the context of many disciplines (computer science, statistics, math, information theory) to find meaningful interpretation of data. This interdisciplinary nature of data science attracts people from all sort of background; economist, physicists, mathematicians, computer scientists, engineers, statisticians and many more. Today we will be interviewing three budding data scientists about their data science journey. All our data scientists have successfully gone through the phase of settling in. They have faced the same questions and hurdles many newcomers in the field are going to meet. We hope this fusion of opinions from our data scientists would provide an aspiring data scientist with a clear picture of the current state of data science in the industry. Do you have the passion for it ? Passion is the name of the game: Data scientists are some of the most passionate people out there. For all of our data scientists it was a conscious decision to move into this field. We wanted to know why. What excites you most about data science/machine learning? Learning to learn: As with most things in life getting started often poses the hardest challenge. All our data scientists took the route of completing a graduate degree to get into the industry. They all felt that their graduate degree was instrumental to their success. How did your graduate degree help you become a data scientist? How relevant is the course structure with the current industry? What happens in a co-op stays in.. :Getting some industry experience in the form of a Co-op/Internship remains an effective way to get into the industry. All of our data scientists had 4–8 months Coop work experience before starting their current job. Could you give an overview of your Coop experience? Skills Needed: The field of data science is ever evolving. The tools and techniques you learned today might not be relevant tomorrow. The field requires a strong commitment towards learning. Name skills that you think one needs the most to succeed in this field? “You need to keep learning. This field is moving very fast. It’s not only about learning a few algorithms or library. To succeed you must keep yourself familiar with the new and exciting stuffs coming out every day. Languages and tools: We asked our data scientists about their choice of programming languages and tools. Which big data/machine learning tools you use every day? The work they do: We asked them about the kind of projects they work on a day to day basis. Could you tell us about a data science/big data project you have worked/working on recently? “I have just finished working on a project for predicting booking cancellation for Left Travel. Cancellation of booking has a huge impact on our revenue.” -Shariful. “Prioritization of vulnerability remediation efforts — Using severity, exploit-ability and business criticality related features to prioritize remediation of vulnerabilities discovered across organisation-wide assets.”- Vishal. Everyone has an opinion: Industry is often different than what people expect. Misconception people have about working in the field? “Not sure about the misconceptions. But regarding the practical industry, all that matters is how you can add value to business. At university, everything is streamlined and well structured. We learn in a controlled environment with predefined expected outcome alongside a point of reference for guidance. But at workplace, it’s not the same. I believe getting exposure to practical industry in the form of co-op is very important.” -Vishal. Avoiding known pitfalls: We asked them about the way they’d choose to do the course again if they have a choice to do so. If you could do it again (learning machine learning/data science), where would you start? “I came here as an international student. Doing 3 courses in my 1st term it was probably a little too much. I would have liked to take things a little slow. I am not the kind of person who does a lot of online training/certifications. I needed the discipline and structure that comes with being in a graduate program” -Shruthi. A window into the future: We asked our data scientists about the future of data science. Where do you think the field is going? “I think it is going into two major directions. The first one is developing new and exciting technologies and really pushing the boundary to explore the extreme possibilities. We see a huge amount of AI start-ups in so many different fields. 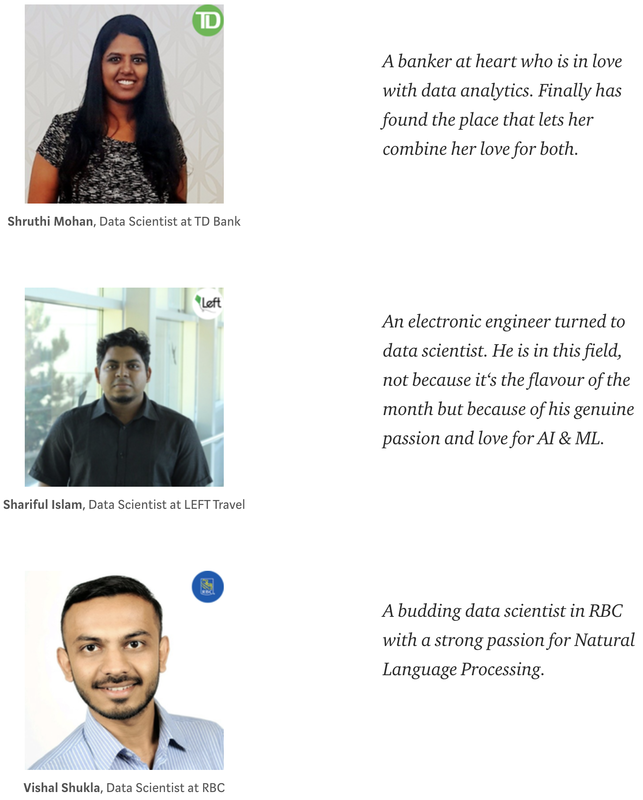 We thank all our data scientists Shruthi Mohan, Shariful Islam and Vishal Shukla for sharing their inspiring journeys and spending valuable time for the benefit of aspiring data scientists.